By Leanne Tan in Culture. Updated on September 5, 2016 . Don’t worry, the Internet didn’t slow down. Technically. But it would definitely be irritating if your cat videos took longer to load because of some policy that benefits Internet providers, right? This online protest wasn’t the first one of its kind though. There were similar online protests that took place when our freedom to browse the World Wide Web was at risk. And of course we would protest! We have heard enough horror stories about Iran blocking Twitter and China monitoring their own sanctioned social media. Therefore, here we’ve put together 4 major online protests in the name of Internet freedom. Recommended Reading: SOPA: Scaring Or Securing The Internet Users? We’ll start off with the one that’s currently making headlines: The purpose of the protest is to educate people on net neutrality, why it is in danger as well as telling the government why it matters. 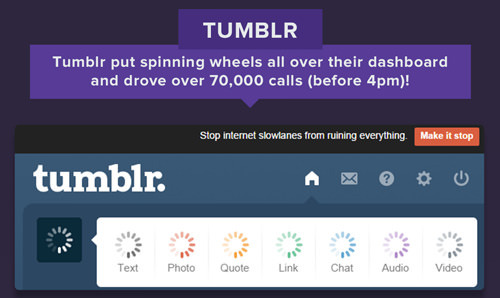 Known as Internet Slowdown Day, sites employed loading GIFs and pop-up messages to simulate what would happened if net neutrality is done away with. Basically net neutrality is the only thing keeping Internet providers from charging extra for certain websites to load at normal speed. But the Federal Communications Commission (FCC) is considering changing that. By doing away with net neutrality, you can say that the Internet would be divided into 2 lanes: a fast lane which is only accessible to those who can pay and a slow lane for everyone else. If the rate of your Internet loading time doesn’t concern you, consider this: Are you able to pay extra for the same Internet speed you are using today on top of daily expenses in today’s economy? The protest is not over as September 15 is the last day for final comments on the act and a rally. This was a popular one back in 2012, as everyone couldn’t access their favorite sites for information. On January 18, 2012, major sites such as Reddit and Wikipedia either blacked out their content or closed down in protest of 2 proposed laws by the US Congress; Stop Online Piracy Act (SOPA) and Protect IP Act (PIPA). The acts were introduced as a way to combat online copyright infringement and the distribution of counterfeit goods. While it had good intentions, it threatened to rid the whole web of chunks of information and user-created content due to the acts’ broad wording. The whole world paid attention when the blackout protest came into affect. As many sites are based in the US, users from the other end of the earth will lose out as well should the acts get passed. And do you know how frustrating it is to Wiki something but not have that information because it was blacked out? (see image below). The protest was a success as the acts were repealed. The Anti-Counterfeiting Trade Agreement (ACTA) was considered Europe’s version of SOPA and PIPA. It had already been drafted in 2010 and signed in 2011 but has yet to take effect. Besides the European Union, signatories also include the United States, Japan, Australia, Canada, Mexico, Morocco, New Zealand, Singapore, and South Korea. 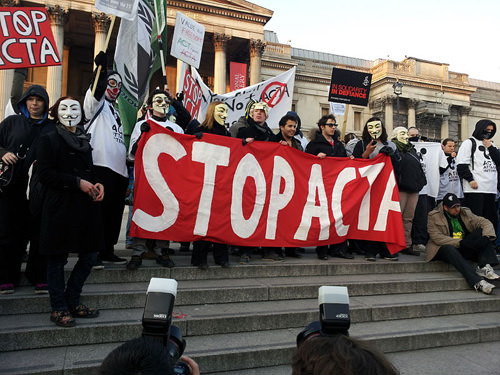 ACTA only gained worldwide awareness after the SOPA and PIPA protests. European citizens were outraged when they found out that the act was negotiated in secret. DDoS attacks shut down government websites, online petitions were circulated and signed, and people all over Europe marched the streets on February 11 and June 9. Public outcry was effective and on July 4, Members of the European rejected the treaty by a staggering 478 votes to 39 votes. Internet freedom includes the right to online privacy, which is what Restore the Fourth champions. The campaign came about after Edward Snowden leaked documents detailing how the NSA spied on US citizens. 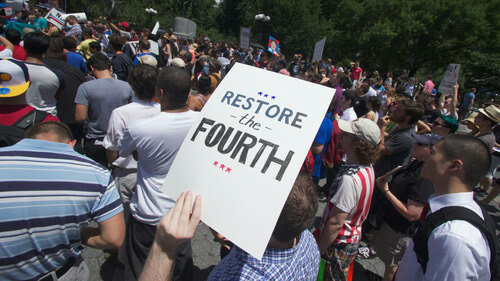 The name was chosen as the organizers, Fight For The Future, believed that the NSA’s actions violate the Fourth Amendment of the US Constitution and set the protest date to take place on the 4th of July. Not only did US citizens come out in droves to rally on Independence Day, prominent websites joined in the cause as well. Mozilla led the way with its online petition, Stop Watching Us. Further protests were held in subsequent months with the most prominent being the Stop Watching Us rally on October 26, 2013 and online protest The Day We Fight Back on February 11, 2014.